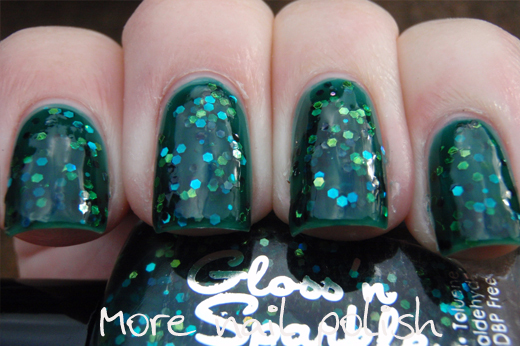 I'm on a real green kick at the moment so when this polish arrived from Gloss 'n Sparkle I was very excited to put it on. 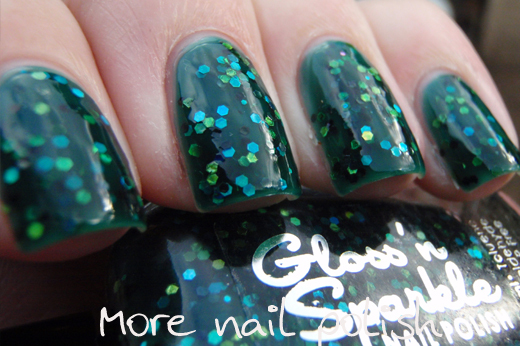 Goblins Grave is a dark green jelly with lime, turquoise and black holo hex glitter. This was three coats and in real life it provided full coverage, but these photos do still show it looking a little sheer at some angles. The jelly base is just perfect in this. It has such a rich dark colour but it is still perfectly sheer so that all the glitters show through. That's exactly what I love about a good jelly polish. This dried nice pretty smooth and I only applied one coat of Seche Vite top coat. 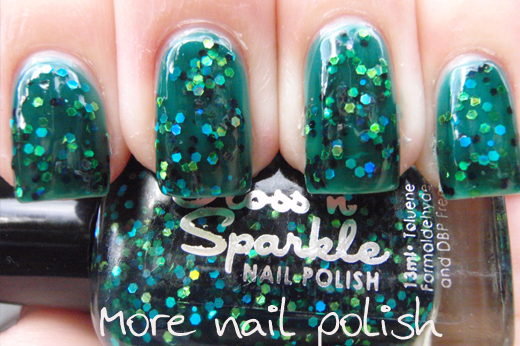 Needless to say, I am completely in love with this polish! This one is available from the Gloss 'n Sparkle an Etsy store for $10 AUD each (but internationals will have to wait until her shipping is sorted). Ok, quick post tonight cause I want to watch Kerry Packers HOWZAT which has just stated on TV. I only saw bits of it last Sunday night cause I was doing my nails, but what I saw was really good. I feel so Aussie watching the show and it really brings back memories for me as a little kid with that classic World Series Cricket music. Ooh! It's beautiful. I've had my eye on that polish for awhile. That is gorgeous! Love the dimension! I am so jealous of you Aussie girls. Honestly my order from EdM just arrived today after about 3 months and then when I went back to place another order I found that she is no longer shipping internationally :( I'm so bummed...I've been lusting for this color for quite a long time as well! Gorgeous!! I have been watching this store. 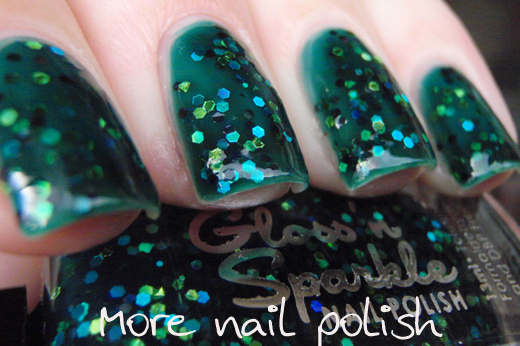 She has wonderful polishes...but I have to wait until she can ship to the USA. Really pretty - sad I cannot get it sent to the US. I don't usually love glitters - but I do love making jelly sands - and this one comes all ready to go all in one bottle! Love when that rare thing happens. Super to know (and that you added to your review) that this one dries to a flat surface and not one that is all gritty and needs a zillion and on thick top clear coats to get it smoothed down. That's no good. I don't recall having any problems with it drying, although I know I was painting at the same time as blogging, so my nails did dry thoroughly between each coat.